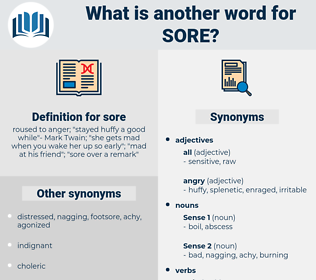 What is another word for sore? roused to anger; " stayed huffy a good while"- Mark Twain; " she gets mad when you wake her up so early"; " mad at his friend"; " sore over a remark"
delicate, thorny, insensitive, bitter, sticking, difficult, sorry, tricky, pissed, furious, mad, weak, fragile. sensitive, painful, sour, upset, painless, distressing, embarrassing, poor, angry, susceptible. pleased, insensitive, good, painless, unimportant, happy, delighted, easy, pleasant, well. good-natured, obliging, pacific, empathetic, calm, amenable, agreeable, amicable, serene, forgiving, warmhearted, amiable, kind, cordial, helping, warm, gentle, affable, sympathetic, satisfied, content, accepting, tolerant, easygoing, complaisant, placid, tender, loving, kindhearted, accommodating, genial, sweet, unbitter, peaceable, indolent, friendly, tranquil, curative, unangry, healing, good-tempered, understanding, remedial, caring. Perhaps the good lady was a trifle sore at never having been invited there herself. The major should be plenty sore at both of us. sheer, scissor, scare, scour, screw eye, sura, skier, ssri, scar, sahara, sauria, sower, shear, squire, shirer, serer, sugar, seizure, shareware, saguaro, swearer, shari, sawyer, sewer, swayer, squeezer, saucer, soccer, square away, scare away, sire, sharer, scorer, seizer, sukur, square, syria, seer, skewer, seeker, surrey, surya, scouser, shearer, succor, scree, scurry, SOR, sciara, sea-ear, swagger, sur, sea hare, scary, share, shire, sokoro, sahuaro, shrew, sarah, sorrower, shore, securer, score, sherry, succour, shower, sr., successor, saqqarah, seeger, scissure, sucker, shorea, sakkara, soiree, squeaker, succourer, scarey, sir, sharia, shirr, screwy, sorrow, saussurea, Sauce Chausseur, sere, sierra, scoria, screw, succorer, sear, sirrah, sorry, saussure, scourer, shariah, seashore, scarer, sixer, soaker, shaker, succory, saree, sucre, saqqara, serow, swear, suer, shocker, sure, Scry, showery, swaggerer, serra, SACEUR, sari, sour, sugary, sr, secure, saury, soar, souari, squawker, Saur. 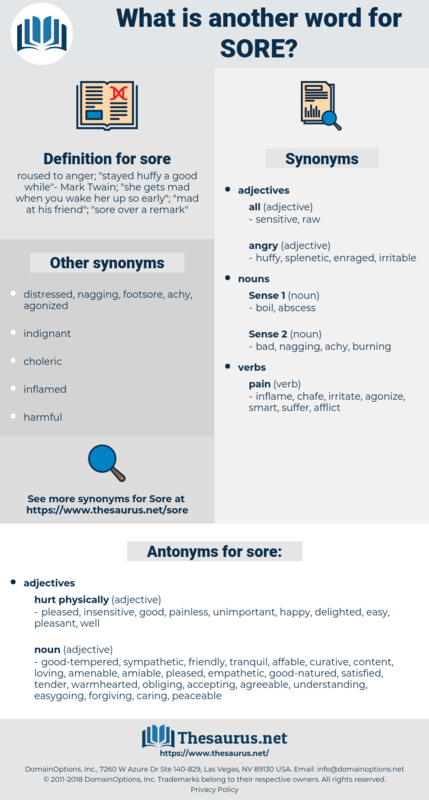 fester, suppurating sore, gall, blain, chancre.